We have hosted up to four students during the summer period, to undertake their MSc dissertation, with a range of projects focusing on major transport corridors, retail centres and consumer profiling, as well as the analysis of crowds at festivals. The students receive £500 for completing their thesis and they also compete to win one of three CDRC prizes, which are awarded for innovative research and analytics, and academic prowess. The success of the scheme is evident from the accomplishments of our students,who have managed to win prizes every year, including 1st and 2nd prizes in 2016 and 2017, and winning the best poster competition in 2018. 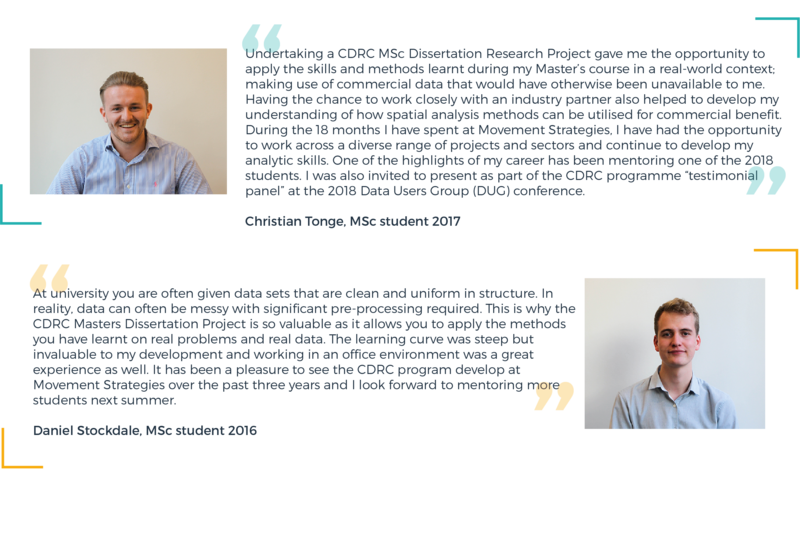 The CDRC programme also provides the opportunity for students to start their careers at Movement Strategies; previous students Daniel Stockdale and Christian Tonge now work full time within our team, as consultants. Daniel and Christian supervised our 2018 cohort of students, during the summer months. The research completed by the 2018 cohort has helped to inform our understanding of the potential insights that can be drawn from our Wi-Fi and GPS big data sets. The value of understanding the potential of these unique and exciting data sets is increasingly important within the realm of smart cities, where the demand for rich and focused insights based on fast data can drive decisions is paramount for key stakeholders.